Ask me anything about Starbucks! We’ve all done it. We sit down at our computer and we ask Google a question. Google will search for any site that seems to have the right answer. 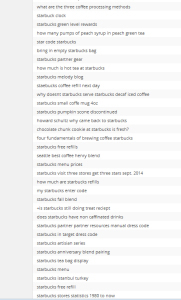 Through a wordpress plug in, I can see some of those search words that lead people to StarbucksMelody blog. I can’t see all of them, because Google hides some of them. (Also, the list the wordpress plug in shows me is ever-changing. It seems to gather only so many.. As new searches appear, old ones drop off. I’m sure I miss a lot too). (And I’m sure I’m also only seeing a tiny, tiny, tiny fraction of these kinds of searches. I have no idea what words lead people to other Starbucks sites). 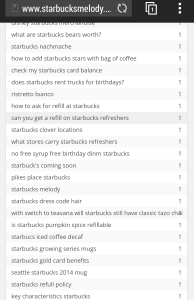 But the bottom line is that I can see a few of the questions about Starbucks that people type into Google. Some of these questions below might make you chuckle a little. Howard returned to Starbucks in January 2008. He wanted refocus the direction Starbucks was going, to be more competitive in the modern business market and to refocus on the core of the business. Things like Pike Place Roast and Thanksgiving Blend coffees were developed during the Onward era, as well as the introduction of the first Starbucks card rewards, the introduction of MyStarbucksIdea.com, and the move to improve the quality of espresso in the stores but removing some older machines and installing the Mastrena espresso machines. This barely touches on it. You can read the whole story in his book Onward. why is starbuck’s morning joe coffee only come in ground and not whole bean? Morning Joe was the same coffee as Starbucks Gold Coast Blend. When sold in grocery stores, it was (for a while) labeled as Morning Joe. If you go to a Starbucks store (or to StarbucksStore.com), just pick up a pound of Gold Coast Blend – it’s the same coffee. Sure. All of your MyStarbucksRewards benefits are associated with your profile, not a specific card. You are never even required to use your gold card. And free refills are a perk even at the Green Level of MyStarbucksRewards benefits. You will need something so that the register knows that you are part of MyStarbucksRewards at the Green Level or the Gold Level. If you have the mobile phone app installed, you can just use that. Or if you have any other Starbucks card registered to your profile, that will work. You will need at either the mobile phone app with your cards on it or a physical card – any card registered to your Starbucks.com/rewards profile. does starbucks send you a free reward when gold is reached? The answer to this is “no.” When the version of the program involving stars was new (there have been several versions of card rewards), I think there was a time that you got your physical gold card wrapped in a coupon that was good for one free beverage, but I’m nearly positive that coupon was discontinued a long time ago. You can get a breakfast sandwich any time of the day, assuming your store has not yet run out of them. You can get lots of drinks with no coffee. Iced tea. Hot tea (including Chai drinks). Creme based Frappuccinos. Hot steamed milk with a syrup flavor (called a Steamer – try a vanilla steamer). Smoothies. Hot apple spice. Blended strawberry lemonade. Hot chocolate. In select Starbucks stores, you can get root beer, ginger ale, and lemon ale. Starbucks calls their employees “partners”. If you work for Starbucks, you are called a partner. If you want to work for Starbucks, the first thing to do is take a look at the Starbucks career center website. Starbucks calls their headquarters (located in Seattle, Washington) the “SSC”. The acronym SSC stands for Starbucks Support Center. does starbucks rent trucks for birthdays? I’m sorry. You can’t rent a Starbucks truck at all, as far as I know. You might want to call Starbucks customer service (1-800-782-7282) but I’m pretty sure they’re going to tell you that Starbucks doesn’t rent any Starbucks trucks. why doesnt starbucks serve starbucks decaf iced coffee? Most Starbucks don’t have the demand for iced coffee to make selling decaf iced coffee a good idea. In other words, if Starbucks finds that they’re selling so little that they’re just throwing a lot of it down the drain, they won’t sell it at all. You have some options. You can visit any Clover – Reserve Starbucks, and your baristas will make an iced coffee for you easily. The Clover brewer is a special single cup brewer, making it easy to make any cup of coffee. You could try an iced Americano. I’ve heard it said that the New England region of the U.S. sells so much iced coffee that it is worthwhile to sell decaf iced coffee: it may be a limited regional menu item in some New England Starbucks. I didn’t make the screen caps for all of the questions above, but you get the picture the kinds of things I get asked. And now, ask me anything about Starbucks! I’ll do my best to answer it. Starbucks Gets Book Bombed! Read all about it! The Starbucks Android Phone App Gets A HUGE Makeover! 12 Starbuckian Tweets to Make You Smile. News and Updates: Android App improves// Create Jobs for USA & free wristbands on Election Day. What is a coffee varietal? @Brooke – You’re totally right. Once you leave the store, it’s no longer a refill. And there’s never a refill perk through the DT. What’s amazing about the refill policy is that you can start with ANY beverage, and get a refill. Start with a grande coffee frappuccino, and then you want a grande iced PT – that IS a refill too (assuming you’ve never left the store). The words “regardless of original beverage” on the website mean that. Why don’t all company Starbucks have high chairs? In the Chicago area it seems to be hit or miss if a location has one, but all other restaurant chains always have at least one. They always have kids drinks just nowhere for little tots to sit. re: You can get a breakfast sandwich any time of the day, assuming your store has not yet run out of them. Unless they turn the oven’s off early, which has happened to me a couple of times towards the end of the night. I also wanted a drink made on the Clover near the end of the night and they shut that off early, too. Alan – Since Starbucks stores are located in so many diverse demographic places, it wouldn’t make sense to have high chairs in all stores. In some places, they’d hardly ever get used. In places where it makes sense to have high chairs (they’ll get used), it usually a decision that it made at the store level, with the store manager and district manager. If you think your local store needs high chairs, I’d recommend that you try to contact either the SM or the DM and talk to him or her about it. Look for the “Share Your Thoughts” flyers inside your local stores. This is probably never going to be the kind of thing that is uniform across all company-operated Starbucks. Starbucks works to be responsive to local communities – and while some have a high demand for high chairs, others don’t. Nice post and it sure opens up thoughts about SB. You know you might have been asked this before but on a personal level Melody if you could create your own SB store, what are the things that are important to you? For me, it is not only the products sold but I would love top premium customer service. @purple1 – The partners would be the first and the most important thing. Having a dynamic, knowledgeable, friendly, welcoming, team that knows how to treat every customer like the regular they like: because who knows who may turn into that person. And then pay that team well. After that, I have a strong preference for Evenings stores (really because of the small food plate options) and Clover – Reserve stores. This is a great, and interesting, article. I love the diversity of questions that people have asked, and that have driven people to your site. That means you’ve already written about all of those diverse topics! @Ensanguin – Long time no talk! Always good to hear from you. Hahaha. You’re right. The volume of blog posts now is enormous so Google has a lot to find. Five years. No breaks in blogging. I just checked and realized something incredible!!! THIS is this site’s 1000th published blog post! Wow!!!! Congrats Melody! 1000th published blog post! Thank you purple1!! What an amazing journey! When I leave a tip using my app do the baristas know it came from me? I feel bad now only leaving a tip on the app. I want them to know I appreciate their awesome service. This is probably too “business strategy” for you to answer, but I have recently wondered how they decide where to put a store. My mom has a place in Sun Lakes, AZ (senior development), which is on the edge of Chandler. I went down to visit, and assumed there would be a nearby Starbucks (since there always is a nearby Starbucks in large metro areas). However, the closest one was 2.5 miles away, and that was an in-store (Safeway). The nearest stand alone Starbucks is 7 miles away. Granted, seniors probably don’t hit up Starbucks as often as those in the younger demo, but I would have thought there would be at least one stand alone store within a mile or so of the area. Okay, that was a rambling way to ask: what kind of business decision goes into opening new stand alone stores? Thanks! If you’re leaving a tip with the phone app, there’s no way for the baristas to know which customer left which tip. Where Starbucks puts new stores isn’t all that straightforward. I genuinely think Starbucks is looking at all kinds of things: What’s the population of the area? The demographics? The possible sites – increasingly Starbucks looks for new store sites that may work well as drive-thru stores. Starbucks has said their going to work on growing the DT side of their biz. How remote is it? Where’s the nearest other Starbucks? What do adjacent businesses look like? In some ways, too remote stores are at a huge disadvantage – getting a shift covered, borrowing supplies from other stores, and the logistics of getting product to them. There’s an area in California that I watched for years wondering if it will ever have a company-operated Starbucks. Lake County, California. I have a friend (of many decades) who lives in Kelseyville, Calif. There is no company-operated Starbucks anywhere in Lake County, California – despite the cities of Clear Lake and Lake Port might be large enough to support them. You have to drive 41 miles to Ukiah to get to a company-operated Starbucks. Lake County is too remote. Starbucks also tends to develop from larger cities going out to smaller cities. From Sun Lakes, you can get to Chandler and have a number of Starbucks. I wouldn’t rule out Sun Lakes getting a Starbucks, but probably Starbucks would argue that area is well served by the many stores in Chandler. Likely they could extend their resources to areas of the country where they’re grossly under-stored. By the way, the population of a town isn’t necessarily the deciding factor. There’s a drive thru Starbucks in Lebec, California that’s one of the busiest in the whole country, despite being in a town less than 2,000. The way that Starbucks sits right off I-5, it catches HUGE traffic with people who commute (or for any reason drive thru) between the central valley of Calif and southern California. I myself have stopped at it multiple times on road trips. And to give an idea of how Starbucks grows stores from big cities outward, Seattle is FULL of Starbucks. The Port Orchard area/ Bremerton area has quite a few. Another 10+ miles away is Belfair, Washington, which only recently got its first Starbucks. Like with your situation of Sun Lakes being served by Chandler stores, it would seem that Starbucks (for years and years) felt that Belfair was adequately served by the Bremerton/ Port Orchard market of stores. I wouldn’t rule out Sun Lakes having a store some day. They actually closed a stand-alone in downtown Anchorage (where I live), in favor of a mall store. In that case, there was competition from a local coffee company’s shop, and the mall store probably made more sense, as the only espresso bar-type store in the mall is the one in Nordstrom. I have gotten a decaf iced coffee, I think it was made with decaf espresso. It’s really good! For the stores having those high chairs, the one I used to frequent a lot had a good amount of them and also has those backless little stools (they make me think of something you’d sit on to milk a cow lol) and then 4 of those red comfy chairs. I wish they had more of the comfy chairs. I am too short to get up onto the high stool and those little stools are one of the most uncomfortable things I’ve ever sat in. 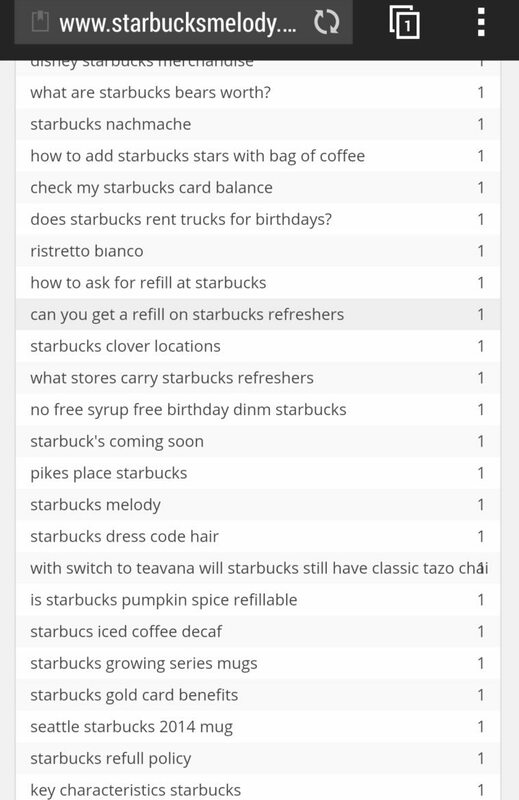 And what plugin do you have to see those keywords people use to find your blog? We live in Western PA and a few places still have decaf iced coffee. At our regular store, my wife and one other person are the only people who order decaf iced coffee. The store manager wanted to get rid of it, but the partners lobbied on my wife’s and the other customer’s behalf and they are now going to keep it. Just chiming in that I think most stores in NYC and NJ have decaf ice coffee. I don’t ever order it but I’m pretty sure it’s an option. 🙂 I think it’s because stores here (and in New England) directly compete with Dunkin Donuts so customers expect to have it. I know that soy gets charged as an extra for purchased hand-crafted beverages, but being charged on a reward came as quite a surprise. Do you know if this is indeed a new policy, or does it sound like this particular Portland area location has invented a new policy? @Hua – That doesn’t sound right at all. Soy should be a free modifier for your Lucky Dozen reward beverage. I’m sorry that you had that happen to you. Call Customer Service! All your modifiers are free for your free drink. Will Starbucks continue to support Verismo? I really enjoy my Verismo but I’m disappointed at how many more kcup options are available. Verismo is Starbucks’ baby. I wish they would at least offer some of the flavored options or start to provide some of the reserve lines coffee for Verismo. @Matt – I know a lot about Starbucks but I don’t have a crystal ball! I can’t predict the future. You’re right there are WAY more K-Cup options than Verismo options. I hope Starbucks doesn’t give up on the Verismo. It’s such an easy way to make brewed coffee – and I think the Keurig machine somehow makes a watery, less enjoyable cup of brewed coffee. But one thing for sure, there are way more people out there who own Keurig machines over Verismo machines. I sometimes wonder if they expected Verismo sales to be better than where we’re at now. At least in the short term, I imagine no big changes. Seasonal coffees will be available as Verismo (like Anniversary Blend) but that K-cups will dominate. When someone orders a drink with a non-dairy option, like soy or the now being tested coconut milk, what type does Starbucks use? Unsweetened, original or perhaps vanilla? @TheKwan – Sorry I’ve been absent from this thread! Yes, there are some amazing CPG category coffees right now. @Lisa – Hope you’re still reading! Sorry I’ve been meaning to get back to this. Starbucks soy milk- A long, long, long time ago, when Starbucks first introduced soy milk, they used the Silk vanilla soy brand – but it hasn’t been that for years. However, just to say, that most Americans have a palate that like sweetened things and that’s what sells. The current Starbucks soy milk is sweetened with “cane juice” of some kind, and IS still vanilla flavored. Starbucks coconut milk – If you’re at a store that offers coconut milk, it’s a sweetened coconut milk, but doesn’t have the vanilla flavor like soy. It’s sweetened with sugar, as far as I know. I know, I know, the entire American diet is sweetened with sugar. I admit, I like it too! If I like my coffee to be caramelly, chocolatey, and spicy, and I don’t like floral, herbal, bright, or acidic. What variety would you recommend? are free refills available for iced coffee, teas, and brewed coffee, regardless of what drink we get? because I got a short kids hot chocolate, but when I asked for a refill on brewed coffee, they said they can’t give refills for different drinks?? @Katharine – you should have been able to get a short brewed coffee of the day as your refill, assuming you stayed in the store. I suggest you call Starbucks Customer Service and tell them about your experience. Sorry that happened to you. 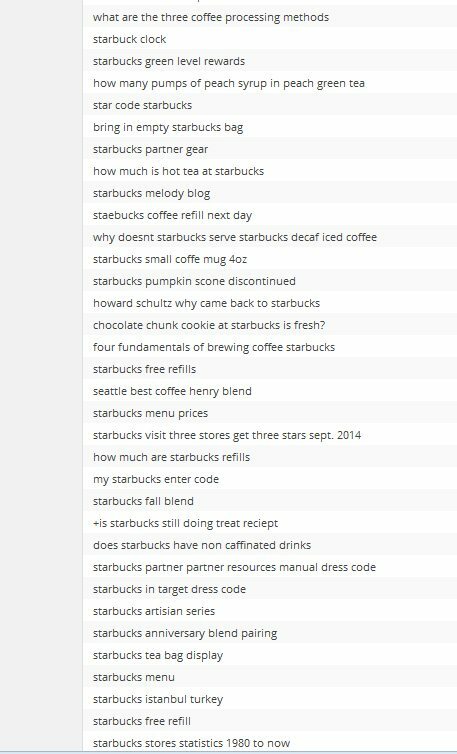 I can’t find the answer anywhere to this: knowing that Starbucks doesn’t brew decaf in the afternoons, what do they use to make decaf latte’s or fraps in the afternoon/evening? I’ve ordered them with no problem but can’t get a cup of decaf coffee.